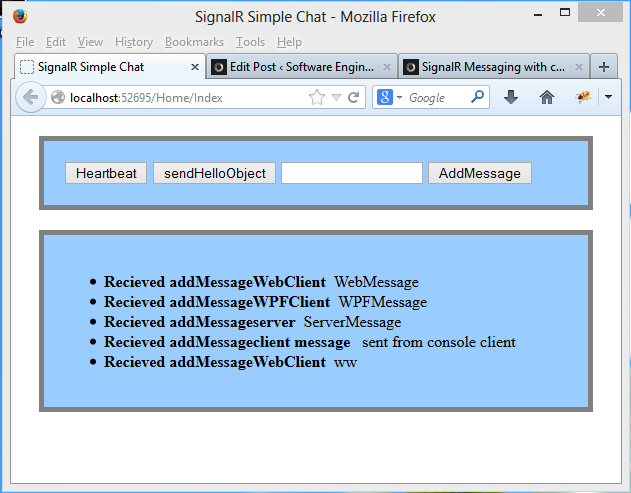 The code in this post is a basic example of a SignalR messaging system. 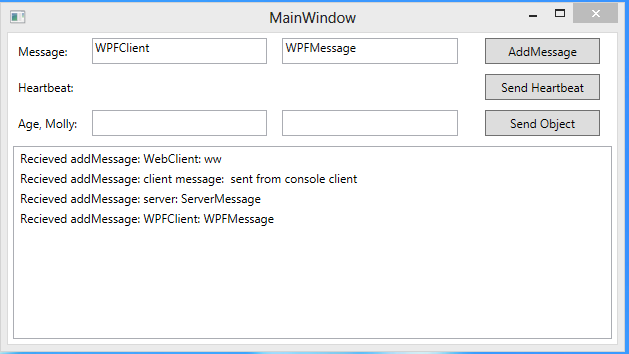 I wanted to create an example which works for 3 client types, WPF, Web and Console. It is built upon the hello worlds provided on the asp.net/signalR website. The hub was then changed to add 3 methods, a simple method with no parameters, a simple method with a DTO parameter and a simple method with 2 parameters. All clients (Web, .NET, WPF) provide example code to send and receive the 3 different message types. The server can also intercept the messages and send messages to the clients. This example is my basic Hello World for SignalR. Only broadcast messages types are sent with no security, or user ids. This class is required in all clients just like a WCF service. The DTO needs to be backwards compatible but no support is provided with SignalR unlike WCF services. This is probably the most robust of the different clients. It’s easy to implement and has lots of documentation on how to implement the different use cases. The client is easy to implement but would require much more error handling and a better abstraction between the messages and the binding. This client works, but the error handling, start up threads need to be implemented. SignalR is very easy to start using, but to use in a production application, the lifecycle events, the details need to be implemented. This is a very exciting technology, which if stable offers a great alternative to WCF full-duplex communication. Good article bro ! Two thumbs up ! Thanks very much for this. I was trying to follow along with the asp.net signal r how-to articles but their code is just plan wrong re: SignalR console clients. Looking at the diff it seems they have left out simple things like .Wait() on the hubConnection.Start().Wait() which means the client just returns and nothing actually happens. Now I have enough of the pieces I can go ahead and explore Signal R, so tyvm. Now that is the way to explain this stuff. Dude, you nailed it . Finally a real scaffold we can build on and not a repeat of hello world and chat chat chat from Richmond and Al. You’re the Man! Very useful article on SignalR. Thanks. hi, i want console server as wcf service. is it possible or not. Very useful article, thanks for your sharing. is it possible to authenticate a user to a group chat with a custom user and pass.? kindly the sample is not working, i got an error while running console server. kindly the sample is not working, i got an error while running the console server.